No More Dusty Dry Tomes! Discover the Exciting Story of the Church -- Illustrated and Easy-to-Read. Shelley’s classic one-volume history of the church makes history come alive! It has become the first choice not only of many laypeople and church leaders, but the standard text in many classrooms around the world. Shelley's clarity, both in language and organization, sets this resource apart. It treats history as the story of people--their motivations, the issues they grapple with, the decisions they make--and the result is that history reads like a story. This second edition explores contemporary movements as well as their leading personalities, the effects of mass media on the communication of the gospel worldwide, and the openness of societies formerly closed to evangelical witness. Charts, images, timelines, and maps throughout the text help provide context and insight. This is a trustworthy and easy-to-read guide. Church History in Plain Language makes the story of the church clear, memorable, and accessible to every reader. NOTE: This is a Topic Notes resource, with images viewable in the Reference Library in v.10.1 or higher. You can select the Reference Library from the e-Sword "Tools" menu, or click on the far-right library button on the main toolbar. Dr. Bruce Shelley is Senior Professor of Church History and Historical Theology at Denver Theological Seminary. He holds the M.Div degree from Fuller Theological Seminary and the Ph.D. from the University of Iowa. Thanks for preparing this book to be able to read with esword. 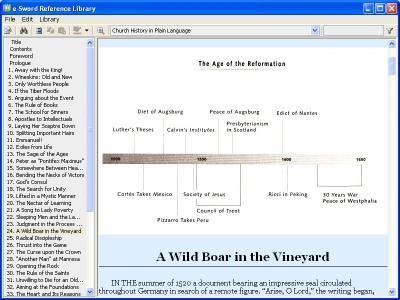 I love history of all kinds especially church history. It is a great help to me in my personal growth. I am thankful for this resource. Excellent very informative and helpful. A concise history that hits on most of the high points. Well written and interesting. The summaries of each period are brief, but sufficient to get the big picture clearly. I find this to be a great resource. It is easy to read and the content is fascinating. I use it as an aid in teaching my family about the foundations of their faith, and it encourages me in my daily walk with the Lord and in sharing my faith with others. Best of all it is in plain language that anyone can understand. Shelley's review of Christian history is refreshing in that it is a readable take on the phases of Christian history without going into all the detail that leaves lots of us disengaged. Great resource. Easily accessible. Thorough and detailed, yet easy to understand. Beneficial to scholar, student and layperson! I use this as reference material in our study group as we study Ray vanderlaan's series of videos. I have found the book very useful for this and will eventually read the entire book. By the way, we are doing this study in Afghanistan and the group is from a variety of Christian cultures. This contains an excellent source on church history. I have a very good, detailed, in-depth church history which is good to read in small bites.It is very erudite indeed; but it is not quick or easy to reference a particular time or event. I find this Church History in Plain Language easy to reference and easy to understand. I find it particularly useful as well as enlightening when I prepare sermons.I am a local (lay) prreacher in the Methodist Church It is clear and cocise enough without eng too short. I believe it to be a very worthhile addition to any Christian who wants to understand ou church history. This resoure is real value for money.